Home›Math›Understanding Algebra: Why do we factor equations? What number could be hiding inside of $x$? 2, in this case. Whoa -- a bit harder to solve, but it's possible. Today let's figure out how factoring works and why it's useful. When we write a polynomial like $x^2 + x = 6$, we can think at a higher level. We have an unknown number, $x$, which interacts with itself ($x * x = x^2$). We add in the original number ($+ x$) and the result is 6. After the interactions are finished, we should get 6. What number could be hiding inside of $x$ to make this true? Hrm -- this is tricky. So let's fight with a trick of our own: we can make a different system to track the error in our original one (this is mind-bending, so hang on). But... how do we actually get the error to zero? It's still a jumble of components: $x^2$, $x$ and 6 are flying everywhere. Factoring the rescue. My intuition: factoring lets us re-arrange a complex system ($x^2 + x - 6$) as a bunch of linked, smaller systems. (That's a 2-d example, with two sticks). we've put the sticks in a "teepee". If Component A or Component B becomes 0, the structure collapses, and we get 0 as a result. Neat! That is why factoring rocks: we re-arrange our error-system into a fragile teepee, so we can break it. We'll find what obliterates our errors and puts our system in the ideal state. Remember: We're breaking the error in the system, not the system itself. Reduce the error to zero: Zero out one component or the other ($x = -3$, or $x = 2$). 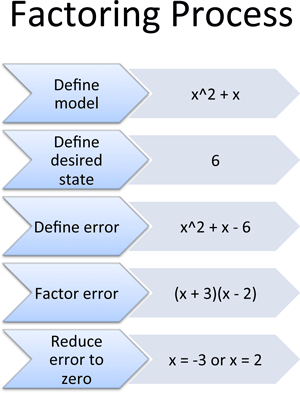 When error = 0, our system must be in the desired state. We're done! Our system is a trajectory, the "desired state" is the target. What trajectory hits the target? Our system is our widget sales, the "desired state" is our revenue target. What amount of earnings hits the goal? Our system is the probability of our game winning, the "desired state" is a 50-50 (fair) outcome. What settings make it a fair game? The idea of "matching a system to its desired state" is just one interpretation of why factoring is useful. If you have more, I'd like to hear them! Multiplication is often seen as AND. Component A must be there AND Component B must be there. If either condition is false, the system breaks. The Fundamental Theorem of Algebra proves you have as many "components" as the highest polynomial. If your highest term is $x^4$, then you can factor into 4 interlocked components (discussion for another day). But this should make sense: if you rewrite an "$x^4$ system" into multiplications, shouldn't there be 4 individual "$x$ components" being multiplied? If there were 3, you could never get to $x^4$, and if there were 5, you'd overshoot and get an $x^5$ term. Do you have a real-world system in a "teepee" arrangement, where a single failing component collapses the entire structure? The quadratic formula can "autobreak" any system with $x^2$, $x$ and constant components. There's formulas for complex systems (with $x^3$, $x^4$, or even some $x^5$ components) but they start to get a bit crazy. Is there any way to prevent a system from having these weak points? (Unfactorable? Non-zeroable?). Don't forget, we thought systems like $x^2 + 1$ were "non-zeroable" until imaginary numbers came along. Understand Ratios with "Oomph" and "Often"